Humans are constantly exerting pressures on ecosystems. We are imposing rising temperatures, carbon dioxide and all kinds of chemicals. We are removing material (like wood or fruits) from ecosystems and we are introducing new species. How long can ecosystems cope with all this? It is impossible to predict this theoretically, but maybe we can tell by studying ecosystem’s reactions to the stress imposed. 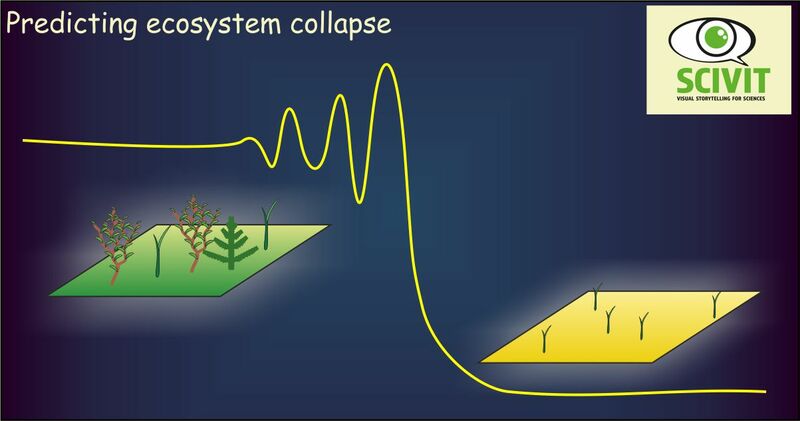 Current theory states that ecosystems, like many other complex systems, show symptoms of „critical slowing down“ before reaching a tipping point towards collapse. Systems experiencing imminent collapse take longer for recovery from perturbations than „healthy“ systems. This increased sensitivity to disturbances can be measured by comparing to a control systems. It is also possible, however, to simply look at the variance of key system parameters. High variance of parameters is a signal for high sensitivity, i.e. for imminent collapse. This approach has been demonstrated to be valid for financial markets as well as for human organs (like the human heart and brain). David Seekell demonstrated experimentally that in ecosystems as well, variability of key parameters is predicting imminent shift or collapse. He continously added increasing amounts of a fish predator to a small lake and followed basic parameters of this lake. One year before the lake shifted from a prey dominated ecosystem to a predator dominated one, there was a clear increase in the variability of phytoplankton biomass. Similar measurements may enable us to determine the stability/fragility of important ecosystems and initiate rescue operations before severe damages occur.